So, here I go again, you will say, harping on the importance of eating seasonally and locally. I will never stop preaching this, just like I won't stop trying to help people "see the light" about the upcoming election. Like today, when I lectured the cable guy on the urgency of voting for change and eventually got him to agree to leave my house and go vote for Obama! A minor victory, but still. My countertops are filled with the bounty of fall and I love it. Our farmer has been coming through with even better stuff than I thought possible this season. Like the beautiful little sweet potatoes that I turned into this dish: Moroccan spiced sweet potatoes (adapted from Alice Waters) that we loved. Or the big, dark green chard I used in this dish of chick peas, tomotoes and chard. Both were equally delicious and while they could have served as perfect side dishes to something more substantial, I didn't have to serve then with anything so I didn't. We just ate them on their own with some spicy red wine on a cool autumn evening. No meat necessary, but a nice roasted chicken would have been the perfect thing. 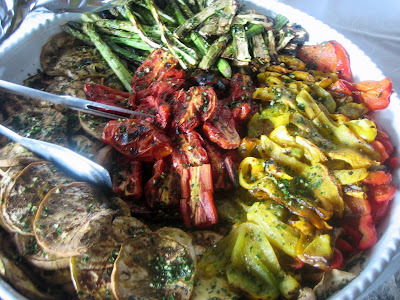 Come to think of it, because of the abundance of beautiful local greens, squash, potatoes and other veggies, we haven't eaten meat in over a week! We probably had something with apples for dessert as they too are overflowing onto my kitchen counters. Apple sauce, apple cake, apple pie, you name it. It's all in the name of eating seasonally. And if you weren't sure that this was good for your health, read this article a friend sent to me today on the surprising benefits of eating seasonally. Peel about 1 lb of sweet potatoes and cut into large cubes. Toss with olive oil and salt and roast on baking dish in 375 degree oven. When done, remove and let cool. a pinch of saffron threads, 1/2 tsp. of grated fresh ginger, a pinch of cumin, 1 tsp. of paprika, salt, 2 tblsp fresh lemon juice, 3 tblsp extra virgin o. oil. Spoon the marinade over the lukewarm sweet potatoes and let sit for 30 min. Serve at room temperature. It's so nice to make something from things that are just lying around. Literally, to walk out in the yard and pick some apples and voilà! A beautiful cake. There's nothing new about it. It's just that I've never lived in a place where the trees were big and old and sometimes fruit-producing. These days, however, most people are too busy to make use of the trees that line our neighborhood streets. Like the walnut trees right now dropping their big, green orbs with nuts inside all over the alleys and yards of East Nashville. Or the apple trees -- some of them just now overflowing with little juicy, red apples --the perfect kind for a cake. My neighbor's neighbor has a tree that hangs into her yard and no one ever picks them. The landlord said she could help herself. We were standing in her backyard this weekend and noticed how full that tree was and how great the apples looked, so we grabbed a bushel and ladder and started picking. 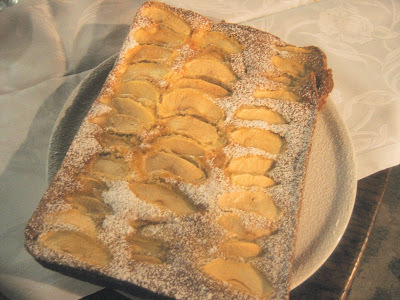 Next thing I knew, I had a Torta di mele, or apple cake, ready for an afternoon snack. While in Italy in September I had the best apple cake I've ever eaten. In fact, the cooking class made it for me for my birthday! They even baked it in the wood-fired oven. Maybe that's why it tasted so good. All I remember is this powdered-sugar- dusted, moist, sweet cake that went so well with vanilla ice cream. Maybe that's what mine needed. That - or mascarpone cream sauce. Because it was a little dry and crumbly, though I think that's how it's supposed to be. Italians don't make a lot of rich, gooey desserts. But they make these kinds of tea or coffee cakes, a breakfast cake, which is why it was perfect for an impromptu birthday cake. 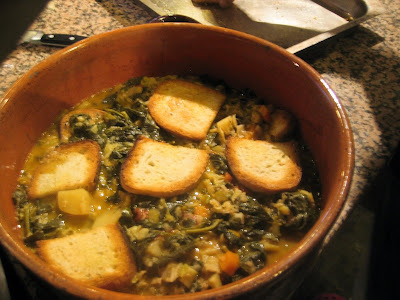 I'd give you the recipe for the Italian one, but it's in Italian and I have not yet translated the measurments. They are very similar though. And the shape can be round or square, or even a loaf. 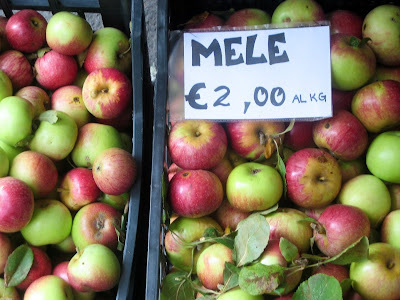 What matters is that your apples are tasty and tart. Combine flour and b.p. Beat butter and sugar until light and fluffy. Add eggs one at a time, beating well between each addition. Stir in dries in three parts, alternating with the milk. Stir in apples. Spoon into prepared pan and level the top. Make a design with apple slices on top, sprinkle with pine nuts if desired, and bake in 375 degree oven for 30-35 min. Ok, so I know you've all been eagerly waiting for me to unveil the new look and new name for the blog, but I have to tell you that I am still not ready. And, just as you should never take a cake out of the oven before it's ready, or open a Brunello before its time has come, a blog name is something I feel I just shouldn't rush. It will come to me when it's good and ready and I don't want to mess with that. Along the same lines, I don't want to rush my Italian trip and put it to rest before it has really had a chance to live out there in the world. On the other hand, I feel the crisp, autumn days slipping away and I love the foods of Fall too much to let them get away without giving them their due. So I'll be sprinkling in the old with the new, getting back on track with posting what I've been cooking in the present, throwing in some of the highlights of my September trip once in a while. Like a good teacher who knows when a subject is putting her students to sleep, I don't want y'all to get bored. Here is something I made on Wed. just in time to sit down with a glass of wine*, a bowl of warm and comforting food... and feel my skin crawl while that man with little arms winced and whined. Just as I'm not a big fan of Republicans (that's putting it lightly) I'm not a huge fan of gnocchi. Except for that one I wrote about in my last post on Roman trattorias. But I am a huge fan of all things autumn --like sweet potatoes, pumpkins, butternut squash and swiss chard. I had some sweet potatoes and chard from the Barefoot Farmer and the gnocchi came from a great little shop in Germantown, Lazzaroli's Pasta. I like to support my local shop owners and Tom is great guy. He stocks all kinds of handmade, fresh pastas, as well as lots of great imported Italian pantry items, plus some salami, pancetta, cheeses and even the tipo "00" flour I needed to make fresh pasta. I sauteed some garlic and parsley in olive oil, then diced the sweet potatoes very small so they would cook faster, threw them in and coverd the pan to let them sweat. Stirring occasionally, I let them cook just until they were soft. The gnocchi only take about 2 min. to cook, so I quickly added the chard and some water to the sweet potatoes, covered again until the chard was wilted and loosened the whole thing with a little of the cooking water and a pat of butter, seasoned with salt and pepper, and tossed it all with the gnocchi, adding freshly grated parmigiano last. It was the easiest thing to make. Much less trouble than most of my pasta sauces and it was hearty and good on a chilly Fall evening. Never mind that the debate was rather tense. When you're armed with gnocchi and red wine, there's not much that can make you feel bad. Ok, better late than never. It is the final hour in a sense, of the name of the blog that is. I need a new name and FAST! So please help, dear readers, with your creative ideas and input. I have already heard from a few friends and am keeping a list of the possible new names that will give my blog that little something that it needs, that something that will identify me and call out to readers in a way that only a good name can do. It would be nice to keep Joy in the name somehow, though not necessary. And, since my propensity is Italian in all things, it would seem logical to keep it in that vein. Italian speakers out there, give me what you've got. If you like, you could vote for one of these, or just add your own using the comments section at the end of this post. 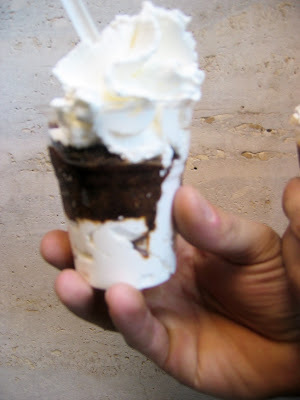 I wish I could say the winner would recieve a trip to the famed Tazza d'Oro caffè in Rome for the best granita di caffè in the world (see above), but alas the winner will actually receive a thoughtful gift certificate that a foodie would love. I appreciate your help and will be unveiling the new name and look in the coming weeks... so stay tuned. 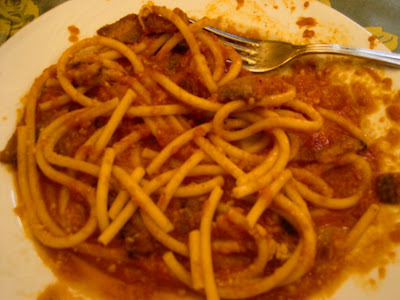 It is often said that it's easy to eat well in Italy, no matter where you go. 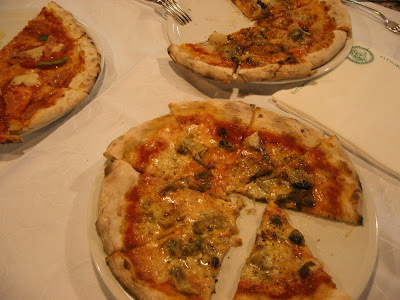 But if you've been there as much as I have you know the truth: that you can eat badly in almost any city if you don't know where to go --even in Italy. 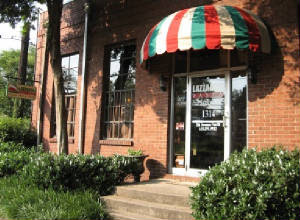 So I always stick to the well-known, reliable and always interesting family-owned trattorias that have been serving the same old tried and true traditional dishes for decades. These local dishes are classics and for good reason, just like the places that serve them. 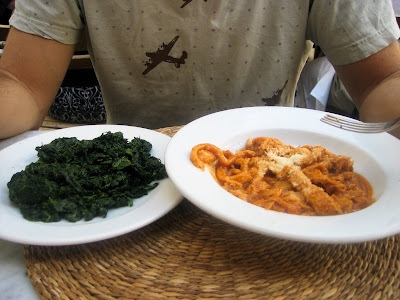 Like this simple lunch at Trattoria 4 Leoni in Florence of tripe with tomato sauce and a side of sauteed spinach. Those of you who are not fans of tripe out there (and you know who you are) you haven't tried it the way the Florentines prepare it. The sauce is the thing here. It's tangy and garlicky and such a perfect foil for the rich, meaty intensity of the stuff. They must cook it for ages, as it has none of that rubbery consistency that gives tripe its bad rap. You'd never know it wasn't just a good bolognese meat sauce with beef or pork. In Florence a favorite breakfast or mid-morning snack is this tomato-based tripe on a roll, a 'tripe panino' if you will. But Florence's trattorias are high-brow compared to the rustic charm of Rome's many unassuming places where traditional Roman cuisine is served up in a humble, no-nonsense environment for those who are willing to wait. The wait is usually because the places fill up so fast at lunch and dinner with diners in the know--locals and a few tourists, power brokers, construction men, families and celebrities--that cooking everything made to order sometimes can take a while. Enjoy the wine and just wait. It'll be worth it. I promise. I had this satisfying and delicious plate of 'pasta alla gricia' at my favorite little unmarked spot in Rome near Piazza Navona for lunch one day. 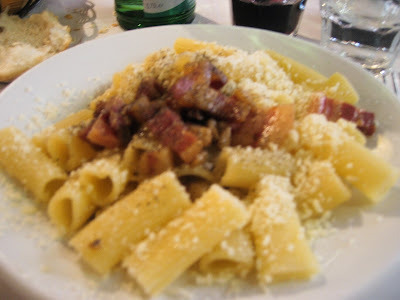 This is a classic Roman dish of rigatoni with sharp pecorino cheese, beautiful and plentiful chunks of crispy pancetta, olive oil, and lots of black pepper. 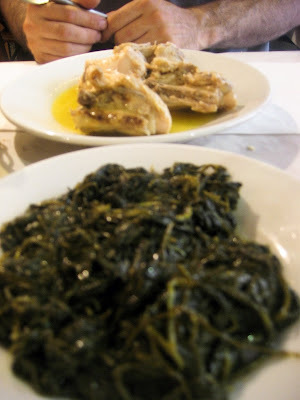 And shared this 'secondo' of coniglio (braised rabbit in olive oil) and cicoria --spicy bitter greens typical all over Rome. 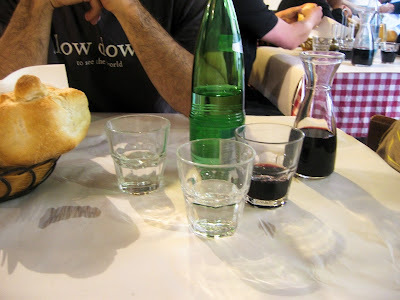 Served with 'vino della casa' and big, puffy, hollow rolls called 'rosette,' it was the perfect repast during a long day of sight-seeing. But this was probably the best trattoria meal we had the whole trip: at Il Portico in the Jewish ghetto in Rome where typical fare includes 'carciofi alla giudea' (crispy fried artichokes, the Roman way), 'spaghetti all'amatriciana' (below), or 'coda alla vaccinara' (oxtail - another Roman delicacy). 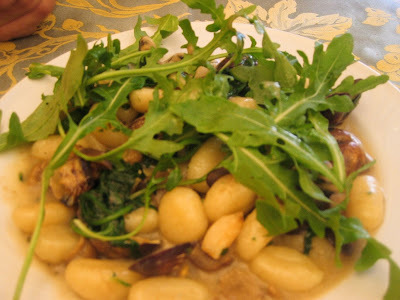 While most trattoria menus boast the same primi and secondi that everyone knows, I thought this was a particularly creative and tasty pasta that surprised me: potato gnocchi with baby clams, arugula and porcini mushrooms. An unlikely combination that really, really worked. Absolutely delicious, and it looked beautiful too. When in doubt, find a trattoria. The more non-descript, loud, chaotic and busy, the better. You'll spend little and eat like the Romans do. I think Fall is my favorite time to visit Italy. 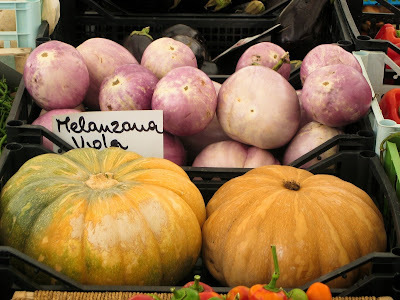 The markets are still alive and offering up the more hearty vegetables of the changing season. 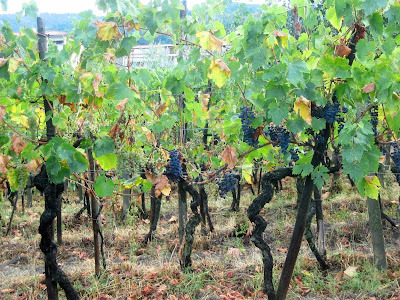 The "vendemmia," or wine harvest, is livening up the small towns where colorful banners adorn the buildings announcing the local grape of which each town is so proud. And the sunlight is somehow milder, though the sun still shines brightly, making the sky a more vivid blue than in the heat of summer, and the cool, crisp autumn air carries the scent of chestnuts and smoke that remind me of cooking over fire and spending more time inside... in the kitchen. My trip to Italy was a combination of work and play, including accompanying two groups of travellers to a Tuscan cooking school where I got to share my love of Italy with new friends and deepen my understanding of rustic Italian cooking. 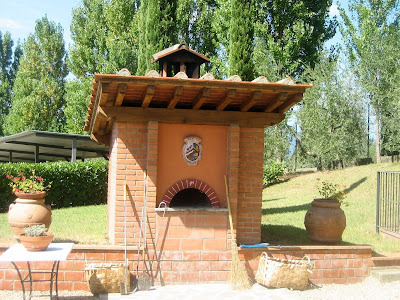 The groups came to Tuscany to learn to cook with wood-fired ovens as well as visit the area of Tuscany where these ovens were made. 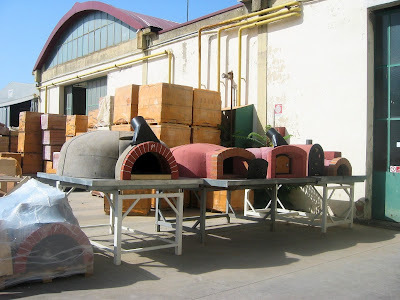 I acted as the liason between them and the Italians and learned alot about wood-fired ovens in the process. Due to a lucky turn of events for me, I was sent to substitute for the owner of the company,Andrea Mugnaini on her Art of Wood-Fired Cooking Course in Tuscany. I didn't have much time to prepare, but my almost 20-year love affair with all things Italian and experience in Italy was preparation enough. My love of cooking and working with people together with my knowledge of the language and the place made for a fruitful and rewarding trip--both for the students and for me. 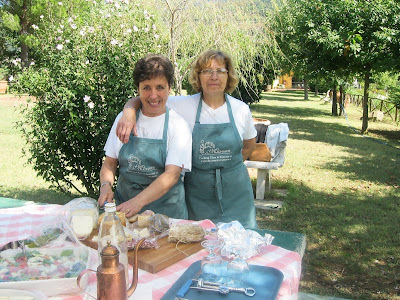 I met some wonderful people and learned many insights into the Tuscan home cook's philosophy (thanks to Carla and Berta, the local experts and my new friends who guided us--and entertained us--in the kitchen). But most of all, I learned a lot about cooking with a wood-fired oven and I am now a convert. 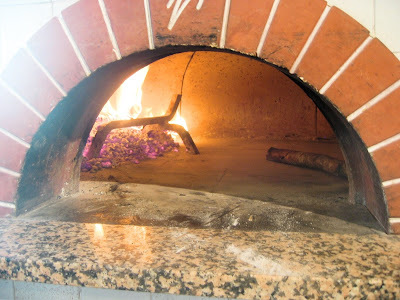 We made everything from bruschetta to eggplant parmesan, ribollita, risotto, roasted meats, grilled 'bistecca fiorentina' and of course, the best pizzas of all time, and even some desserts --all in these beautiful Tuscan-made ovens, of which Ms. Mungaini is the sole U.S. distributor. We even visited the factory down the road from our cooking school/hotel where the ovens are made and received a warm welcome from the Valoriani family who've been making ovens by hand in the traditional way for more than 60 years. It was an amazing trip and a rewarding experience for me. I gained a new appreciation for the simplicity of Italian home cooking, one that already informed my own philosophy, but that I continue to expand and deepen each time I have the opportunity to visit Italy and cook with locals. I hope to share more of these insights with you here. 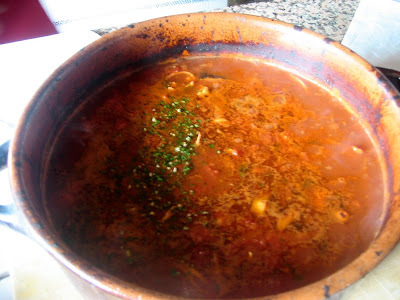 But I'll start with a recipe for "la Pomarola" --a simple, deeply flavored sauce of tomatoes and vegetables that is the backbone for many Italian dishes. Its versatility lends itself to all sorts of sauces--from a simple red sauce for pizza, to the sauce that thickens eggplant parmigiano, to the liquid base of any ragù (meat sauce). This sauce is built in stages on the basis of slow and low stovetop cooking. Start by mincing together as finely as possible, finer than you normally would, the first 3 ingredients. Heat some extra virgin olive oil in a heavy-bottomed pan and add the minced onion and herbs. Cook until softened and the aromas blended, stirring constantly, for about 10 minutes. Then chop your carrots and celery, roughly, and add to the mix. Then add your can of tomatoes, salt and pepper and bring to a boil. Stir well, turn down the heat and simmer, covered, on the stove for about 1 to 1.5 hours, or until the carrots are soft. Pass the whole thing through a food mill or ricer so you end up with a smooth, red sauce. Season to taste. Please stay tuned...it'll be worth it! I am out there! Still alive, I promise. It's just that I've been working. Hard. In Tuscany. And then on vacation in Rome, Siena and Florence with my man. So it has been difficult to write, especially since the Italians still haven't figured out the wi-fi thing. Can you blame them? 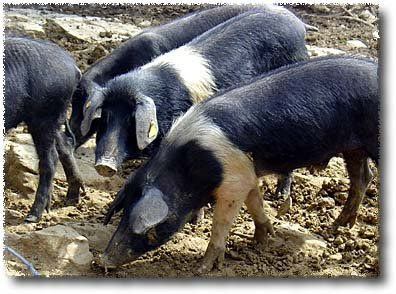 They've got more important things to do-- like eat gelato three times a day and raise Tuscan heirloom pigs. So, before you go and desert me for good, know that I am going to be back --soon--with lots of great stories, recipes and photos from my travels to Italy. 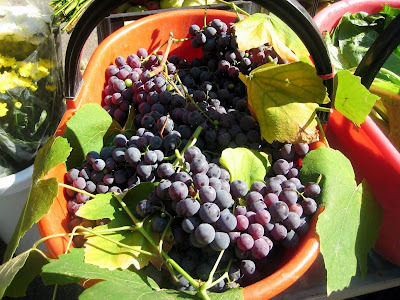 The wine harvest, the food, the wood-fired oven cooking classes... it's all still to come. And much more. so stay with me. PS: in addition to new stories and adventures to report, my blog will have a new name when I return. It seems that someone out there already has Joy of Cooking as their moniker. Someone with a highly successful cookbook and one that is backed by a powerful and potentially litigious publishing company. Ok, ok. I get it. It was time for a change anyway. Fall, my favorite season, is underway, the leaves are changing and the weather turning cool and inviting. What better time for a change of scenery?